There is a growing interest in using market signals to assist in decision-making. A number of studies have shown that companies can benefit from the creation of “prediction markets,” which are artificial markets explicitly created to elicit the consensus forecast of important variables. Thus, companies making investment plans in 2018 may be very interested in the expected level of sales revenue in the year 2019. Rather than assigning one person to make a forecast, a prediction market uses cash awards to encourage many employees to offer their best guess of the target variable. Studies suggest that the median guess of a large number of individuals is often superior to the estimate of any single individual—a concept known as the “wisdom of crowds.” Indeed, the efficiency of markets for stocks, bonds, mutual funds, and commodities is based on this same idea—the consensus wisdom of a large number of traders. Prediction markets can assist any decision maker, not just those in the corporate sector. Monetary policy is an area especially well suited to this sort of market. Decisions made today on interest rates and the money supply can have an important impact on spending, prices, and employment in the following year. Unfortunately, economic modeling is still a very imperfect science, and central banks often have difficulty estimating the impact of current policy settings on future economic outcomes. As Mercatus Center senior fellow David Beckworth has pointed out, central bankers face what has been called the “knowledge problem,” the problem that the knowledge needed for optimal economic decisions is dispersed across the economy. Hence, even when central bankers are exceptionally intelligent people, they still do not have all requisite information for setting optimal monetary policy in real time. By channeling the “wisdom of crowds,” policymakers can make more informed policy decisions. The Mercatus Center and Hypermind, a private company that creates prediction markets, established a set of nominal GDP (NGDP) prediction markets, one for 2017–2018 and the other for 2018–2019. We choose NGDP for several reasons. First, the United States already has market signals of inflation expectations, including CPI futures and the spread between the (nominal) interest rate on conventional bonds and the (real) interest rate on inflation-indexed bonds—the so-called Treasury Inflation-Protected Securities (TIPS) spread. Unfortunately, there are no good market signals of expected NGDP growth. Second, NGDP is closely related to the Federal Reserve’s (Fed’s) dual mandate for price stability and high employment. While many people focus on the Fed’s 2 percent inflation target, the Fed actually puts equal weight on employment, which is closely linked to real GDP growth. Nominal GDP growth is the sum of inflation and real GDP growth, and hence it closely tracks the two key variables in the Fed’s dual mandate. While the Fed does not explicitly target NGDP growth, an increasing number of Fed officials have mentioned NGDP as a possible future target, and even today it is likely that NGDP growth is closely correlated with the underlying goals of Fed policy. In the Hypermind NGDP prediction markets, one contract was created for NGDP growth between the first quarter of 2017 and the first quarter of 2018, and another contract for 2018:Q1 to 2019:Q1. The value of this contract at maturity, when the initial GDP figures are publicly announced, is set equal to 10 times the percentage growth rate. Thus when a 4.8 percent NGDP growth rate for 2017:Q1 to 2018:Q1 was announced in late April 2018, the contract’s maturity value was equal to $48. During the year before the contract matured, Hypermind traders would buy and sell these contracts with a sort of “play money” called Hypermind dollars. At the end of the contest, the most successful traders were awarded prizes in the form of gift certificates for Amazon. A total of $70,000 worth of gift certificates are to be awarded in the two NGDP prediction markets. Because prediction market traders do not use their own money, and thus do not suffer monetary losses, these markets are generally not affected by the sort of complex regulations covering either gambling or sophisticated financial markets. However, even though prediction market traders do not risk their own funds, studies suggest that the possibility of winning money is enough to motivate useful market forecasts. Source: Hypermind and the Mercatus Center, NGDP Futures Contract Prices from Q1 2017 to Q1 2018 (dataset). 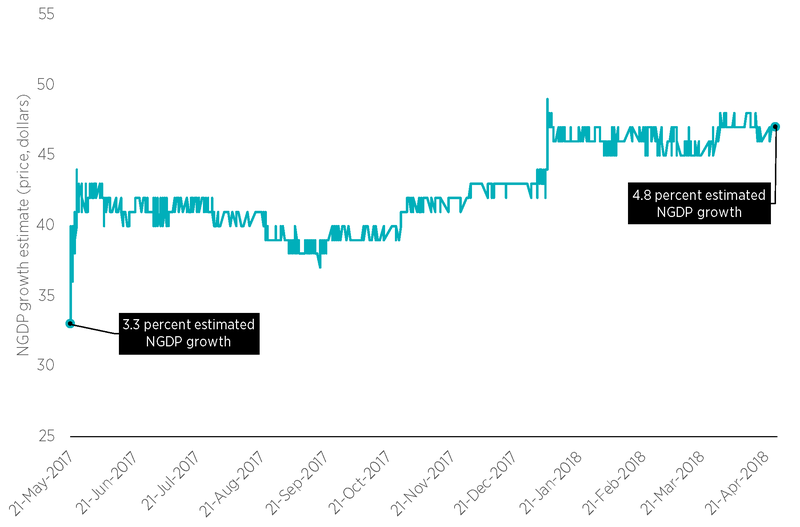 After the market was created, NGDP growth expectations quickly rose to roughly 4 percent (a price of $40), which is roughly the average NGDP growth rate during 2009–2017. Keep in mind that this is the market for nominal GDP growth, which is the sum of inflation and real GDP growth. Over time, NGDP growth expectations increased, and by January 2018 they were close to 4.8 percent, which was the actual outcome announced a few months later. At the time this policy brief was written in September 2018, the 2018–2019 Hypermind NGDP contract was trading at a price indicating roughly 4.9 percent expected NGDP growth. After the completion of the 2017–2018 contract, the Mercatus Center interviewed some of the more successful traders. Participants were asked to explain what sort of factors they found most useful in making predictions. The answers showed a wide range of approaches to forecasting. Some traders focused on the consensus private sector forecast of real GDP growth and inflation, while others looked at “nowcasts” of real GDP growth produced daily by the Federal Reserve banks of New York and Atlanta. If that were all the prediction market trader did, however, then a prediction market would have very limited value. Fortunately, traders also used a wide variety of other forecasting techniques. Some traders cited changes in public policy, such as the recent corporate tax reduction. Some relied on recent economic data, while others examined asset price movements that might be correlated with changes in future NGDP growth. Several traders indicated that they consciously took “contrarian” positions, one because he felt many pundits were too pessimistic about the effects of President Trump’s polices, while another argued that traders were misjudging the stance of Fed policy—assuming it was more contractionary than the actual policy stance. The wide range of information used by traders demonstrates one important advantage of market forecasts. They aggregate a wide range of perspectives into a market consensus, which is sometimes called the “wisdom of crowds.” These market forecasts are very different from decision-making by committee, which can become subject to “groupthink.” Members of the Federal Open Market Committee (FOMC) often look at the economy in roughly the same way, using similar models (such as the Phillips curve) and focusing on similar economic indicators. A growing interest in having central banks target nominal GDP. A growing interest in the concept of “target the forecast,” which means setting the policy instrument at a position where the central bank forecast equals the central bank target. A growing interest in asset prices as forecasting tools. In recent years, a number of prominent Fed officials, as well as an increasing number of influential private economists from across the ideological spectrum, have suggested that NGDP targeting might be superior to inflation targeting. This partly reflects the fact that inflation is subject to both supply and demand shocks, and hence it is not a reliable indicator of economic overheating (i.e., too much demand). For instance, during much of 2008, NGDP growth slowed as inflation increased. In retrospect, it is clear that the NGDP growth figures were more accurately reflecting the actual state of the economy, and that monetary policy should have been more expansionary. Under an NGDP targeting regime it would have been indeed more expansionary. Even if policymakers switch to NGDP targeting, they still face the daunting task of determining exactly which policy settings are most likely to lead to on-target NGDP growth. Some economists prefer what are called “instrument rules,” where the Fed funds rate target is set according to a mathematical formula reflecting economic conditions such as past inflation and real GDP growth. The famous Taylor rule is one such example of an instrument rule. In contrast, Lars Svensson had advocated the concept of “targeting the forecast,” which means setting the policy instrument at a position where the internal forecast of the central bank is exactly equal to its policy target. To take a simple example, Svensson would argue that if the central bank is targeting inflation at 2 percent, then the interest rate target should be set at a position where the economic research unit within the central bank forecasts an inflation rate of 2 percent. It makes no sense to set policy in a position where it is expected to fail, where inflation is expected to be at a level different from the policy target. But this raises another important question: which forecast is optimal? The Efficient Markets Hypothesis (EMH) suggests that market forecasts are superior to any individual forecast, even by an expert, because they aggregate the perspectives of a wide range of traders who have access to different types of information. This idea has revolutionized many different fields. For instance, the EMH underlies the increasing popularity of index funds as a way for ordinary people to invest in the stock market. The EMH has also revolutionized political analysis. In earlier decades, political experts tended to rely on public opinion polls. But these are subject to various forms of bias, as not all groups are equally likely to respond to pollsters. Thus, political analysts now tend to give some weight in their predictions to election prediction markets, which aggregate the views of many different individuals. Everywhere you look there is a growing financialization of the economy. The creation of the TIPS market in 1997 allowed for the direct observation of market inflation expectations in real time. Not long after, TIPS spreads (market inflation expectations) began to be discussed in FOMC policy meetings. Thus, it is clear that monetary policymakers are keenly interested in market forecasts of the goal variables. Each year, more and more prediction markets are created, predicting everything from elections to sporting events to movie grosses. It is difficult to understand why it took so long for an NGDP prediction market to be created, as NGDP is probably the best single indicator of whether monetary policy is too expansionary or too contractionary. Given that the Fed has already expressed an interest in TIPS spreads, it likely would be equally interested in market forecasts of NGDP growth. Had this market been in existence during 2008–2009, it might well have provided valuable signals to the Fed. After all, even Ben Bernanke admits that the Fed erred in September 2008, when it refused to cut its target interest rate from 2 percent right after Lehman failed. At the time, TIPS market expectations of inflation were much lower than Fed forecasts. But NGDP growth expectations are even more informative about the state of the economy than inflation expectations. In the end, the Hypermind NGDP prediction market is a sort of demonstration project. One would hope that the Fed will set up its own (better-funded) NGDP futures market, which could help it to make more informed policy decisions. The cost would be trivial relative to the potential gains from more effective monetary policy. Elsewhere I’ve argued that in the long run NGDP futures could provide a way of instituting a policy rule where monetary policy was always set at the position that the market consensus believed was most likely to lead to on-target NGDP growth. We are still a long way from that sort of policy regime, but the Hypermind NGDP project is a useful first step. Justin Wolfers and Eric Zitzewitz, “Prediction Markets,” Journal of Economic Perspectives 18, no. 2 (2004): 107–26; Robin Hanson, Ryan Oprea, and David Porter, “Information Aggregation and Manipulation in an Experimental Market,” Journal of Economic Behavior and Organization 60 (2006): 449–59. James Surowiecki, The Wisdom of Crowds (New York: Anchor Books, 2004). David Beckworth, “The Knowledge Problem in Monetary Policy” (Mercatus Policy Brief, Mercatus Center at George Mason University, Arlington, VA, July 2017). Henry W. Chappell Jr., Rob Roy McGregor, and Todd A. Vermilyea, Committee Decisions on Monetary Policy: Evidence from Historical Records of the Federal Open Markets Committee (Cambridge, MA: MIT Press, 2005). Scott Sumner, “A Market-Driven Nominal GDP Targeting Regime” (Mercatus Research, Mercatus Center at George Mason University, Arlington, VA, 2013). Fed officials such as New York Fed President Williams and Atlanta Fed President Bostic have mentioned NGDP targeting as an attractive option. Prominent economists such as Michael Woodford, Bennett McCallum, Larry Summers, Christina Romer, George Selgin, and Jeffrey Frenkel have also spoken favorably about NGDP targeting. Interestingly, the idea has substantial support among both “liberal” and “conservative” economists. Lars E. O. Svensson, “What Is Wrong with Taylor Rules? Using Judgment in Monetary Policy through Targeting Rules,” Journal of Economic Literature 41, no. 2 (2003): 426–77. This is not to say market forecasts are always correct; rather, they are more likely to be correct than individual forecasts. Ben Bernanke, The Courage to Act: A Memoir of a Crisis and Its Aftermath (New York: W. W. Norton and Co., 2015). Scott Sumner and Ethan Roberts, “The Promise of Nominal GDP Targeting” (Mercatus Policy Primer, Mercatus Center at George Mason University, Arlington, VA, 2018). Do Prediction Markets Aid Defenders in a Weak-Link Contest?